I have been trying to loose weight and break some unhealthy habits for a while now and it is HARD. I am really good at working up anticipation for a new challenge and starting those first few days with a lot of motivation and energy. Then after those first few days and I have not seen any change yet I start to plateau and go downhill either getting right back to where I started or getting further away from my starting point. This is something I have struggled with for a good portion of my life so it is something I know I needed to break out of and needed an outside force to help me with keeping on track of some of my fitness and health goals. So when my friend Lila, one of our other writers, suggested we have a motivation board party I was excited, and a little nervous because it would mean I would have more accountability to stick with things I have been having a hard time sticking with for more than just a week or so. Unfortunately at that party I ended up talking instead of crafting and I left with no motivation board. Then a few months went by and I was sick of sitting around and doing nothing to change my low level of motivation that I was finally ready and I finally put my board together! My favorite part of making my motivation board was that I could make it my own. I could make it with the specific goals I had, whether they were spiritual goals or physical goals, and I could let my personality shine. 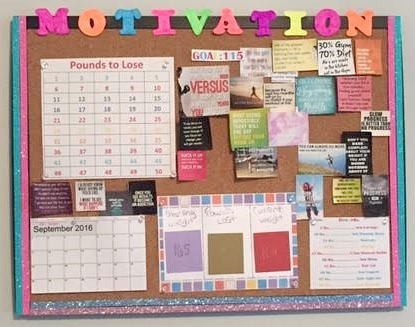 It can be customized in so many ways so instead of following mine step by step I will share with you the different parts of my motivation board and you can take what you like and add your own ideas. As you will see my motivation board was specifically made with my weight loss goal in mind. 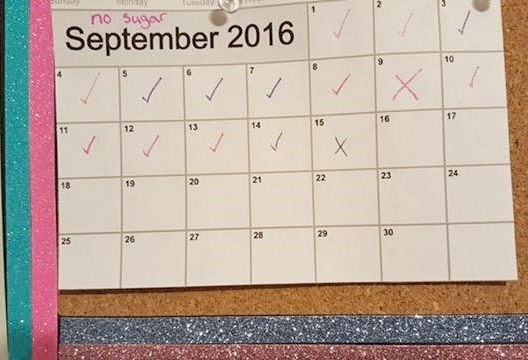 One of the components I added to help me with that was a calendar that I could use to mark off everyday I accomplished a big goal which happened to be no sugar for the whole month of September. I put my motivation board on the wall in my room right next to the door so everyday I would see it, whether I wanted to or not, and everyday I would be reminded of my failure or successes from the previous days. When I saw a big X in one of the boxes I could always feel myself becoming disappointed with myself but at the same time it gave me an extra push to try harder that new day. Another big component of my motivation board was a piece of paper I had printed that had a box with every single pound I wanted to loose. This was a physical reminder I could see of where I had to go but more importantly where I had already come, because when times get hard that is what you have to remember so you can remind yourself that you can do it because you already have. 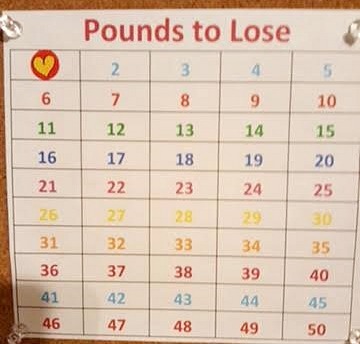 This can also be displayed with a string and clothes pins or a jar of cotton balls, one with the pounds you need to loose and one with the pounds you have lost. 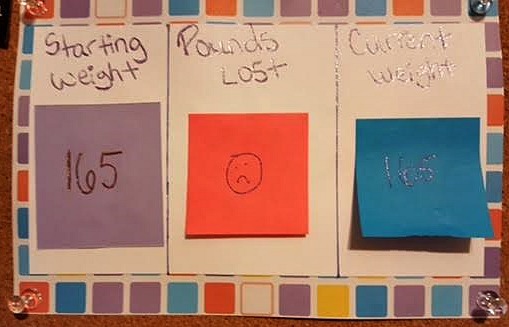 Another way I was able to incorporate a reminder of how far I have gone is through this weight tracker. I try not to weigh myself more than once a week because I know that if I do I will just get discouraged so I would weigh myself every Monday morning right before my Pilates class. Then as soon as I got home I would replace the middle and right sticky note with their new numbers and add any stickers to the pound loss chart. Here is my favorite part of my motivation board, the rewards. 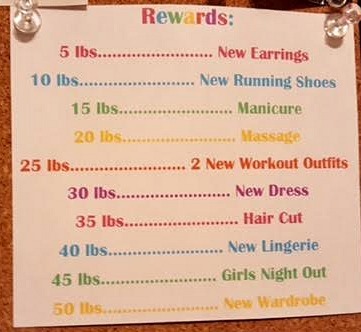 I knew that the motivation board would help keep me more on track towards my goals but I knew that if I rewarded myself for progress I made I would be even more likely to reach those goals because even if I couldn’t see the changes my body was going through I would be reminded of the changes it was making when I reached each of these smaller goals. Keeping my motivation board in my bedroom and on a wall that I knew I would look at every single day was how my motivation board helped keep me motivated even on the days I wanted to give up. It was a daily reminder that I had come so far and even though I had a further way to go to reach my goal I could do it because I had the tools to do it. What are some of the ways you keep yourself motivated to reach your goals? What are some of the goals you are currently working towards that a motivation board would help you stick to? « How to make DIY Stanchions for your event!